1989 Lets Play - features movement! 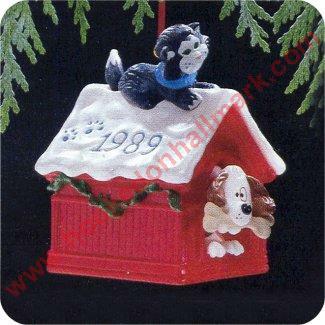 Home > Hallmark Ornaments By Year > 1989 Hallmark Ornaments > 1989 Lets Play - features movement! These two friends are a playful pair! Tap the house gently to see the pup wiggle his head up and down and the kitten waggle her tail side to side! Dated 1989 in snow on roof.